TORONTO, June 24, 2015 /CNW/ – Open Streets TO is proud to announce that the 2015 Open Streets platform, a world-class recreation program unlike any other in Canada, will take place between 9:00 am and 1:00 pm on Sunday, August 16 and Sunday, September 6, 2015. The 5.0 kilometre route will comprise Bloor Street (between Spadina and Parliament) and Yonge Street (between Bloor and Queen), connecting some of Toronto’s most diverse neighbourhoods. Crossing points will be included at numerous major intersections, where cars will be permitted to pass through as normal. Open Streets are programs that open a city’s streets to people and close them to cars. People traffic replaces car traffic, and the streets become “paved parks” where people of all ages, abilities, and social, economic, and ethnic backgrounds can come out and improve their health. In 2014, Open Streets drew more than 20,000 participants per program date, including runners, cyclists, skateboarders, roller bladers and walkers, among many others, who interacted with their city and other people in unique ways never before experienced in Toronto. In addition to these open streets, parks and public spaces along the route, or “hubs”, will be programmed with activities organized by members of the community, providing a window into what each neighbourhood has to offer. Community organizations, businesses, and individuals from across the city are encouraged to pitch an activity idea (or ideas) for the 2015 program. Activity leader applications are now being accepted – more info can be found at www.openstreetsto.org. Local businesses are also encouraged to get involved and to take advantage of this unique opportunity. Open Streets TO is designed to showcase the local community and businesses along the route − no outside vendors are permitted. Merchants in other Open Streets cities, such as Los Angeles, have not only seen an increase in business during and after their program days, but have also had the opportunity to reach out to new customers from other parts of their city. Ryerson University will once again be partnering with Open Streets to provide program evaluation support research, designed to learn from, and improve upon, the overall platform offering. 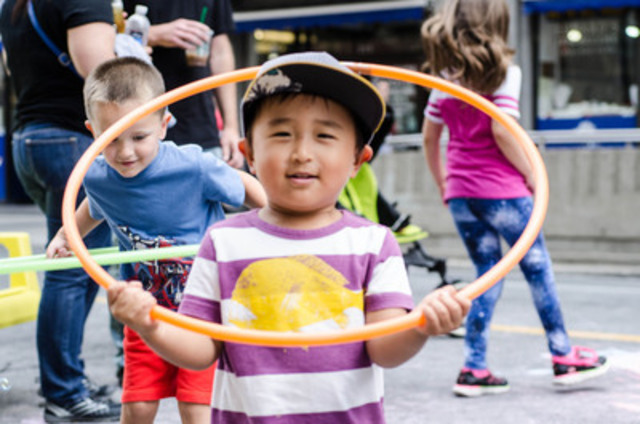 Topics such as “Social Inclusion and Diversity”, “Youth Engagement” and the “Importance of Physical Activity” will be studied to ensure that Open Streets program development can be tailored to address Toronto’s pressing needs. Open Streets is proud to announce that current sponsors include City, Downtown Yonge BIA, 8 80 Cities, Tricon Capital Group, Toronto Parking Authority, Bike Share Toronto, Ryerson University, The 519 and Bennett Jones LLP. The Open Streets TO program cannot happen without the generous support of volunteers. In 2014, the pilot program was supported by more than 300 community members. Volunteer opportunities for the 2015 program are now open, and the application process is available on the Open Streets TO website. For more information about Open Streets TO, visit: openstreetsto.org, follow us on Twitter (@OpenStreetsTO or like us on Facebook Open Streets TO).